Scientists are putting silkworms on a diet, but it isn’t because the little critters are packing on the pounds. Rather, researchers from the Institute of Materials Research and Engineering (IMRE) in Singapore have discovered a way to create “intrinsically colored” silk by stuffing the worms with a mixture of mulberry leaves and fluorescent dyes. Because the dye molecules become part of the silk filaments, the luminescent hues that result are permanent. DayGlo-colored silk may be a novelty, but the researchers insist that the technique has environmental advantages, as well. Pre-dyed silk curtails the use of water and chemicals associated with the dyeing process, for instance, reducing the toxic burden in our waterways. As it stands now, silkworms are cultivated for the express purpose of spinning cocoons, which are collected, processed, and spun into yarn. Dyeing silk fibers at this point is not only water-intensive, but it can also involve nasty chemicals that poison textile workers and environment alike. Dyeing silk is not only water-intensive, but it can also involve nasty chemicals that poison textile workers and environment alike. “The new, more environmentally friendly method allows us to integrate colors into the very fabric of silk and does away with the need for manual dyeing,” Natalia Tansil, the project’s lead researcher, tells Australian Geographic. While there’s no word on whether the use of fluorescent dye is itself problematic—the entire concept could still be a wash if the dye is toxic—it’s an intriguing idea nonetheless and one Tansil insists is inexpensive and scalable. Plus, by opening the possibility of introducing other compounds into the silkworms’ diet, the technique could have applications beyond the fashion industry. The research team envisions using silk with antibacterial, anticoagulant, and anti-inflammatory properties in wound dressing or as biomedical frameworks for repairing damaged tissue. Has anyone involved in the research considered the effects of these dietry restrictions on the health and wellbeing of the silk worms themselves? They talk above about the possibilility of the silk being produced as toxic, what about the silk worms. Clearly the researchers dont understand the fickleness of the fashion industry when it comes to color either. Whats in one season is very much out the next! No, really? They've just found this out now? Amazing! I'm 53 this year. 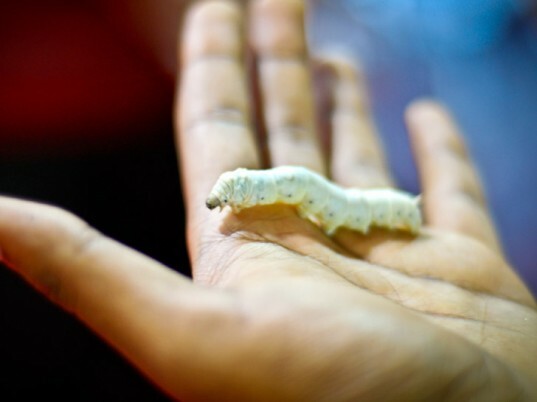 When I was a child I kept silkworms for a while. We found that in addition to mulberry leaves, they loved beet leaves. And they made pink silk from that diet. That's around 45 years ago. The picture of that worm makes me want to barf. I don't think I'll be wearing silk anymore. By the way, isn't "florescent dye" still harmful? Scientists are putting silkworms on a diet, but it isn't because the little critters are packing on the pounds. Rather, researchers from the Institute of Materials Research and Engineering (IMRE) in Singapore have discovered a way to create "intrinsically colored" silk by stuffing the worms with a mixture of mulberry leaves and fluorescent dyes. Because the dye molecules become part of the silk filaments, the luminescent hues that result are permanent. DayGlo-colored silk may be a novelty, but the researchers insist that the technique has environmental advantages, as well. Pre-dyed silk curtails the use of water and chemicals associated with the dyeing process, for instance, reducing the toxic burden in our waterways.